This is a day late…but whatever… I never like following the rules anyway. 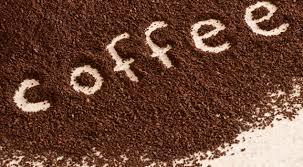 Yesterday was National Coffee Day so I’m going to give a nod to it and say of all beverages… doesn’t it deserve a special day of recognition ? 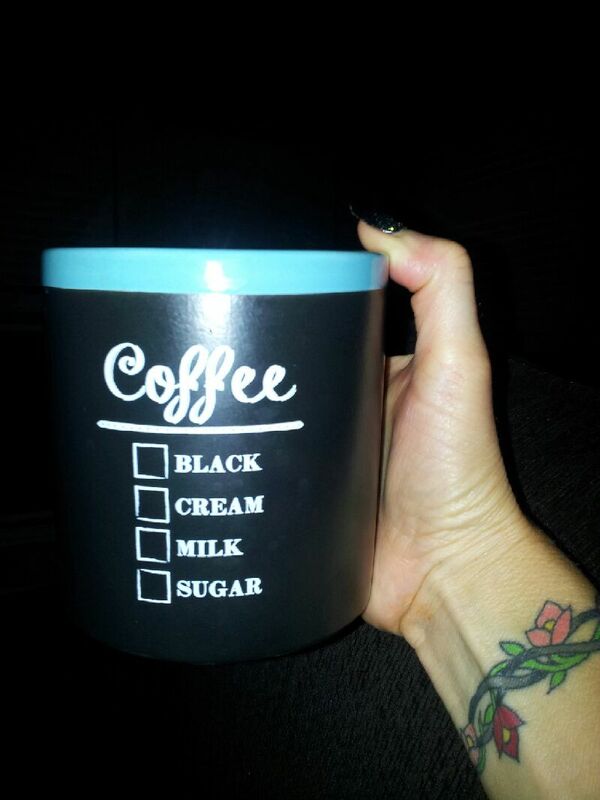 I’m an easy to please no frills kinda girl with my coffee….I like it bold and black. My day starts early and I am a happy camper to have a coffee pot that can be set to brew coffee before I roll outta bed. I mean really, to slowly be coming to life and smell it waiting for you ? Ah… one of the 7th wonders of the world… glorious…. Stumble out… beady eyed… messy hair… find fav big cup… pour…. breath in…. and you begin to be infused with….life…. Once it brings me to life and my day is going, it is almost inevitable that later morning I’ll be making a stop at my fav coffee shop, Starbucks. Now if you have issues with “the corporation” over something… don’t blow me up…. I do enjoy the coffee and since I drink it black it’s the 1) cheapest and 2) zero calories to the desserts in a cup they serve up as drinks. But I figured out a long time ago as much as I love the coffee, I love the people who are there. 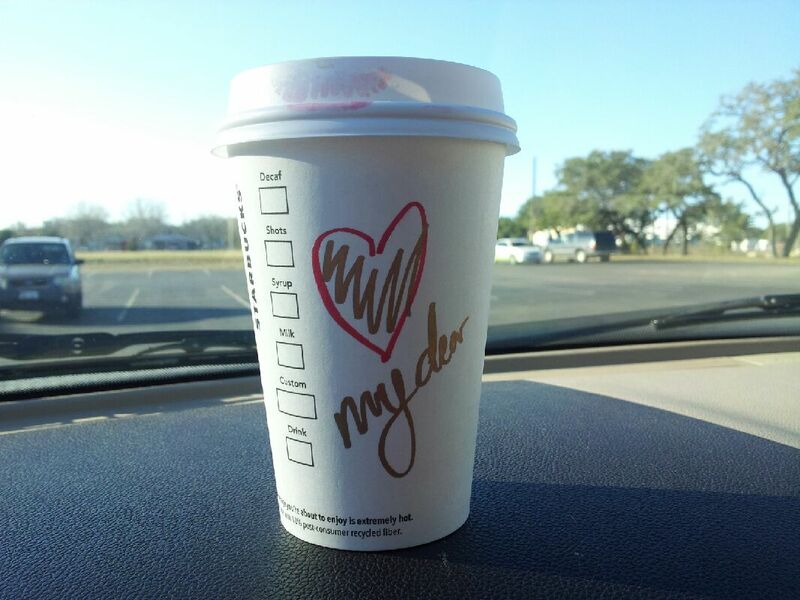 Ok… the baristas. Hard working, most of them youngish, often in school, and full of ideas and new dreams. I love getting to know them and make a point to connect with the new ones who show up. I love their energy and for some reason they think I’m cool. It’s a win/win thing. I’ve had times of hanging out with some of them and having some really good conversations. Or listening to their struggles or whatever they were currently up to. They are often hard worked and sadly, can be treated badly by people. I try and bring them homemade treats at random times to let them know I appreciate them and their work. They know what I like and often have it waiting for me by the time I get in the door. I often hang out and read or write and they just let me make myself at home. The regulars. The ones who are there predictably at the same times, in the same places. There are a group of guys who hold down one corner and they always are wanting to know about my running and what’s going on athletically. One gives me weather reports when I tell him my run days. Another is an older man who could be my dads age. He want to know if I’m over my running injury yet, or if I ran or cycled that morning. He was the one who kept asking me and encouraging me when I had confided in him I was toying with a 50K race earlier this year. He told me he was proud of me when I finally signed up. He is a sweet man who’s wife passed away a couple years ago. The entire place has kinda claimed him as “family”. One older man has been a runner for years and has done countless marathons. I met him before I ran my first one and I shamelessly picked his brain for training ideas. None of them seem phased when I come cruising in my athletic clothes, no make up and sweaty from a long run. Many times they will offer to buy my coffee. Several of them think I’m crazy for doing what I do… but they admire me for it. They all make an interesting group of individuals. Of course there are the friends I know and run into while I’m there OR my favorite, a total stranger that I can have an interesting conversation with. My favorite place is to be on the patio on a perfect day, reading or writing, and watching the world go by. It’s my favorite escape activity…. 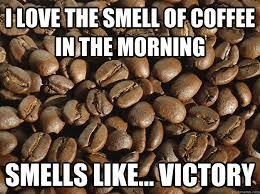 all the while enjoying coffee too…. I mean, is there a time when coffee isn’t a perfect accessory to daily activities ? This is my kinda coffee cup…. What about you ? Are you a coffee drinker? If so, do you have habits or rituals you do with it ? So Much Food. What To Eat ? Let me say first, what works for me, might not be the “thing” that works for you. Also, on any given day what I eat depends on the training I’m doing. Obviously, my needs are greater with a 20+ mile run, versus a strength training day so my caloric intake can be quite different. And the other thing…. it will also depend on our likes and dislikes and overall personal tastes. I don’t follow any current “trends” of don’t eat this or that. Unless you have a food allergy/health reason, eat the food. It disturbs me how many people today follow a certain trend without even knowing the why’s of doing it…. There are some things that I do which, I believe, are beneficial to everyone…. I rarely eat fast food. I don’t do a lot of processed, refined or fatty foods. I keep sugar to a minimum. I don’t drink alcohol or sugary drinks or fake sugars. I skip creamy stuff like mayo, spreads, and those sort of items. I prefer whole grain/brown foods over “white”. Side note…. 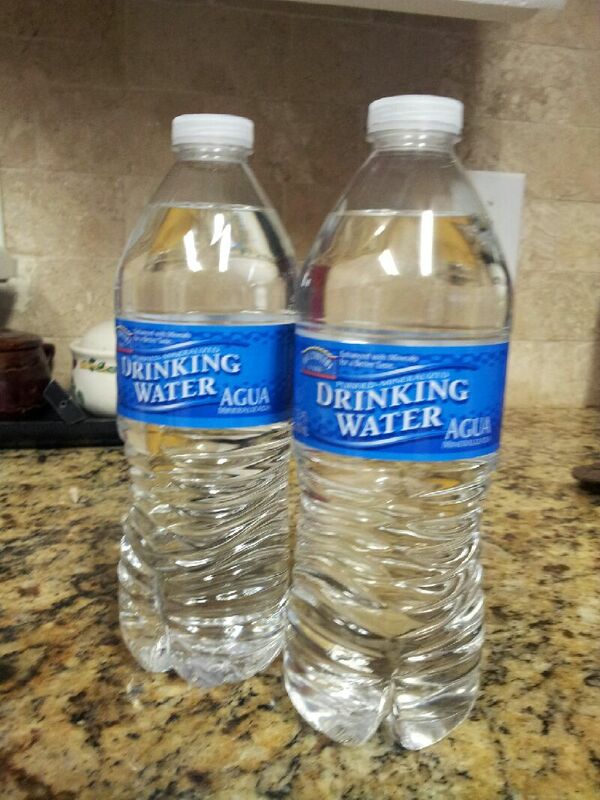 I don’t use bottles… I really run around with a big glass full of ice water.. it travels everywhere with me. 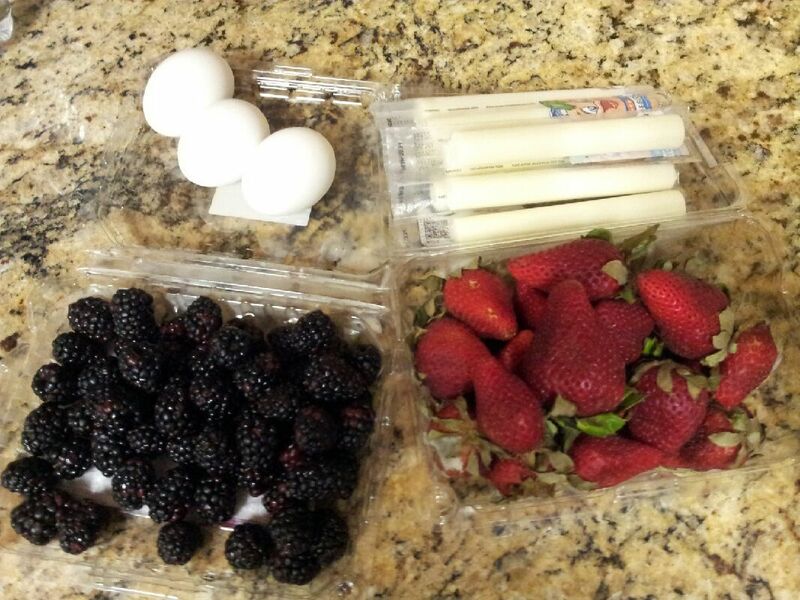 One of my fav healthy breakfasts…. Fruits and veggies make up a large part of my daily nutrition. Not shown here are sweet potatoes. Such tasty little suckers. I often roast them with some olive oil for dinner, and use the cold ones with my breakfast or toss them in with my lunch salad. 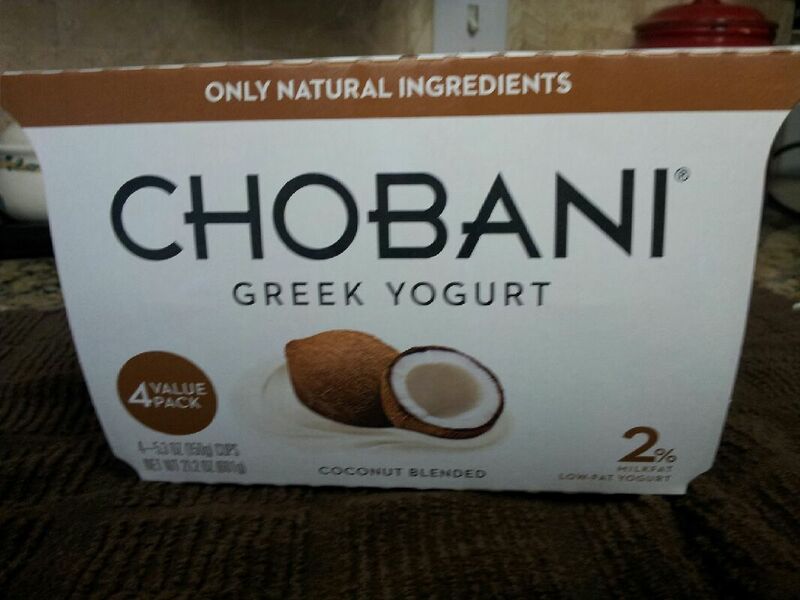 These are a great nutritional super food. 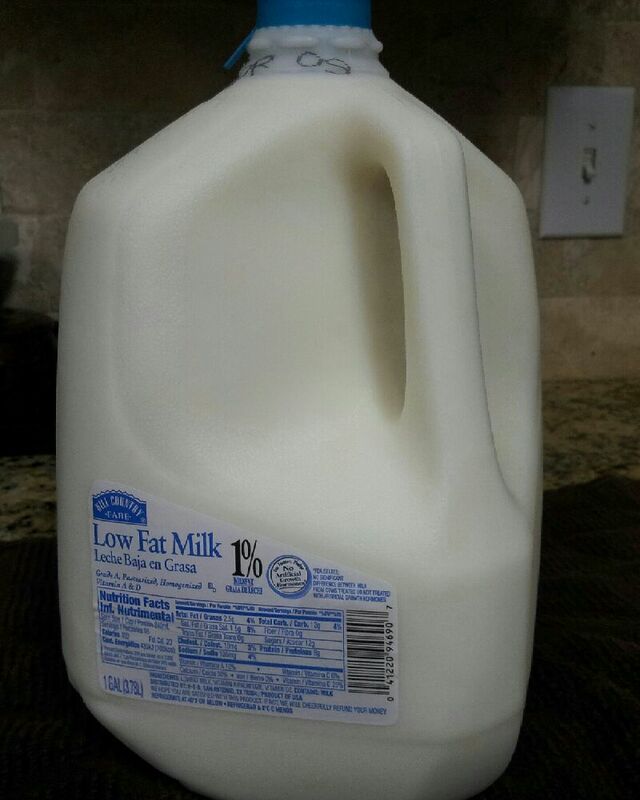 Protein is very important with my training to make sure my muscles have enough to grow on =) I know it’s not currently trendy, but I love real milk. No apologies. Eggs are a perfect breakfast food for me. I also keep them hard boiled for afternoon snacks. 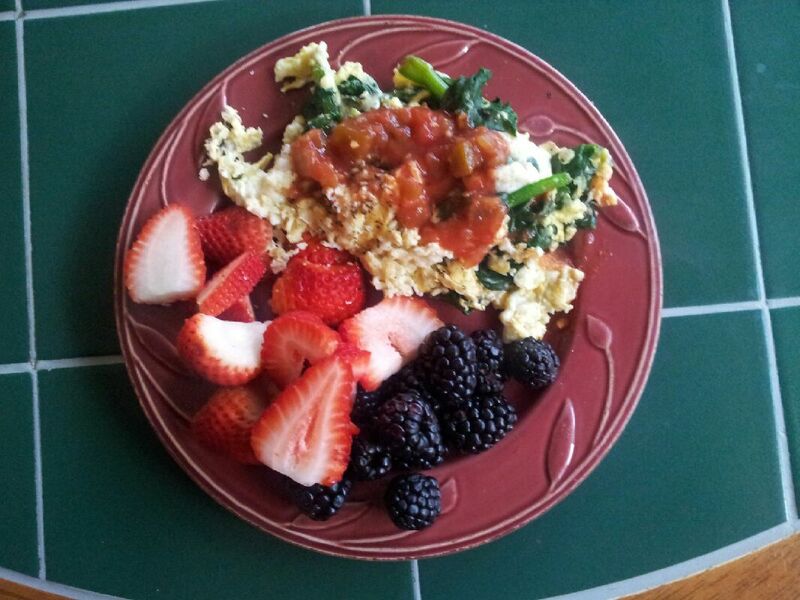 I eat the whole egg… the most important nutrients are contained in the yolk. I find protein does a much better job to keep me feeling satisfied and “level”. I have no issues with “grains” and enjoy multi whole grain breads/bagels, oatmeal and some cereals. Basically, I try and eat, the majority of the time healthy foods. I don’t believe in eliminating food groups unless you have a valid health reason to do so. And of course, this is always a part of my day. Isn’t coffee a food group ?? I’ll tell you this, of myself and people I know who have it going on nutritionally, they have a strong foundation in their daily diet of lots of fruits and veggies. These not only fill you up with less calories, the nutrients they deliver to your body contribute to your overall health,wellness and appearance. Start by eating more of what you like. Try something new every day or two. Experiment with new recipes to get more veggies in. Do fruit salads instead of veggie salads in your meals. Reach for these things as snack items…understand you must train yourself to do so. Stop treating these foods like they are the enemy…they are health and wellness for you. Oh, and if you can’t STAND a certain veggie/fruit… then.. don’t eat it! There’s a lot more out there to choose from. Posted on March 25, 2015 March 25, 2015 Categories diet, diets, fitness, food, health, healthy eating, lifestyle, nutrition, wellnessTags coffee, dieting, diets, eating healthy, fat loss, food, healthy living, how to eat healthy, nutrition2 Comments on So Much Food. What To Eat ?